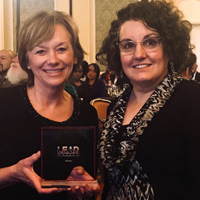 Webster University’s Global Leadership Academy (GLA) received two awards at the 38th annual LEAD Awards, which recognize organizations’ outstanding leadership training and development programs. Webster was the top university in two categories: Best Social Collaboration and Knowledge Sharing (3rd out of 150 total entries) Best Global/International Program (10th out of 200 entries). Jenny Broeder, director of GLA and professor in the Department of Nursing, and Holly Hubenschmidt, co-director of GLA and head of Instruction Liaison Services in the library, accepted the awards for Webster at the 2018 event last week. GLA's curriculum addresses leadership domains for higher education as well as the complexities of Webster's global network. 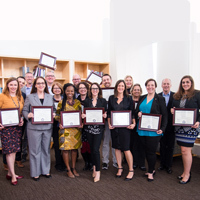 Launched in 2012, the Global Leadership Academy at Webster University is a leadership development program open to the faculty and staff of the university's global community. GLA fellows are selected each year to participate in a series of workshop and activities that help them to lead successfully in their roles and positions within the university. The primary mission of the GLA is to invest in the people of Webster University so that they may lead from where they are. The GLA is unique in its approach to leadership development, with a curriculum that addresses the leadership domains required for successful leadership in higher education, and also opportunities to understand the complexities of Webster University. GLA fellows study and learn with others from around the university with close access to the initiatives, people, and places that make Webster University a distinctive place to work.